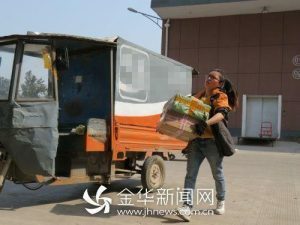 In Jinhua, Zhejiang Province, a 23-year-old girl named Wang Fang works for the delivery company Yongkang and she is their only female courier. Female couriers are quite rare, so many people did not understand her career choice. But after half a year, people have come to admire her for her hard work, good appearance and excellent customer relations. Her colleagues also praise her pointing out that “She is the goddess of our department”. She uses an electric tricycle to make her deliveries. She is not tall and has a thin build, and after parking the tricycle, walks with a trot even taking stairs two at a time, in order to return to her Tricycle and finish her deliveries rapidly. When the company hired her, they assigned her to work in the office, but Wang Fang refused because she wanted to be a courier. It can sometimes be a bit rough on the hands, but six months doing this job, Wang Fang has not had a delayed delivery and no customer complaints. Character Spotlight - Translated, News, Translations. permalink.